Elizabeth K. Helsinger, John Matthews Manly Distinguished Service Professor, Departments of English and Art History, and the College, University of Chicago. Chapter four of the author's Ruskin and the Art of the Beholder, which Harvard University Press published in 1982. It has been included in the Victorian Web with the kind permission of the author, who of course retains copyright. The decorated uppercase M is based on Ruskin's The Aigiulle Blaitiere in Modern Painters IV. Numbers in brackets indicate page breaks in the print edition and thus allow users of VW to cite or locate the original page numbers. When page breaks occur in the middle of words, the brackets appear after the word. 2. Weiskel, The Romantic Sublime, pp. 22-62, makes this distinction. I have drawn on his analysis of the concept in the following discussion, though my account of possible resolutions to the sublime challenge does not entirely follow his. 3. Weiskel gives this interpretation of the passage in The Romantic Sublime, pp. 194-204. See also Hartman, Wordsworth's Poetry, pp. 16-l8. 4. Byron's piecemeal method is not presented as exclusively a beholder's sublime, The status of the speaker of Childe Harold is somewhat unclear. On the one hand, he is a traveler and not a professional poet; on the other hand he is, by Canto IV, not a separate dramatic character (Childe Harold disappears), and his poetic ambitions are increasingly a subject of reflection. 5. Evans and Whitehouse, Diaries, I, 116-117, no-122, 124, 129, 132-133, 169, 170, 175. 7. See, for example, Francis Hutcheson, Inquiry into the Original of Our Ideas of Beauty and Virtue (1725): absolute beauty springs from "Uniformity amidst Variety," pp. 15-16; or Alexander Gerard, Essay on Taste, pp. 30-33. 8. John Rosenberg, The Darkening Glass: A Portrait of Ruskin's Genius (New York: Columbia University Press, 1961), pp. 10-20. 12. In 1883 Ruskin noted the "insolence of these abrupt and unhesitating theological assertions, now become extremely painful to me, and much repented of" (4.199). 13. Bradley, Ruskin's Letters from Venice/span>, pp. 244-45, 246-48. 15. MS published posthumously in Ireland's Hogarth's Illustrated; quoted in Arthur Clayborough, The Grotesque in English Literature (Oxford: Clarendon Press, 1965), p. 6. 16. See Wolfgang Kayser's discussion of Schlegel and Richter in The Grotesque in Art in Literature, tr. Ulrich Weisstein (Bloomington: Indiana University Press, 1963), pp. 48-56. 17. Hugo, Preface to Cromwell (1827); see Kayser, The Grotesque, pp. 56-59. 18. Walter Scott, "The Novels of Ernest Theodore Hoffman," Foreign Review, I (July 1827). 19. Ruskin showed special interest not only in visionary and Gothic grotesques but also in fantasy art and literature, from Shakespeare and Scott to children's fairy tales. Himself the author of a fairy tale, (The King of the Golden River, 1841), Ruskin also discussed the importance of fantasy as a healthy exercise of imagination in his Modern Painters II chapter on the grotesque and in a late lecture, "Fairy Land," in The Art of England (1884). Landow draws attention to "Ruskin's valuable perception that fantastic art and literature form part of a continuum which includes sublime, symbolic, grotesque, and satirical works"—"And the World Became Strange: Realms of Literary Fantasy," in Diana L. Johnson, Fantastic Illustration and Design in Britain, 1850-1930 (Providence: Museum of Art, Rhode Island School of Design, 1979), P. 36. 20. Walter Benjamin, Illuminations, ed. Hannah Arendt (New York: Harcourt, Brace and World, 1968), "The Work of Art in the Age of Mechanical Reproduction," p. 221.
ore than any other Victorian, Ruskin retained a romantic taste for sublimity. Yet the "beholding imagination" he described is not well suited to cope with the romantic or Burkean sublime. His beholders have the picturesque traveler's limitations: they must gather and compare many partial views before they can comprehend or fully respond to what they see. Have these beholders any access to the emotional intensity of the romantic sublime? The beholder's limitations of sight and understanding govern two kinds of aesthetic response which Ruskin discusses at length, the "grotesque" and the "noble picturesque." The noble picturesque uses excursive exploration to evoke strong feelings, while the grotesque, though it is a response to a single impression, consists of fragmented images like those acquired by excursive seeing. The grotesque and the noble picturesque are nonetheless versions of sublime experience. Both the fantasy or fearful symbolism of the grotesque and the active sympathy of the noble picturesque are equal in emotional force to the experience of the Burkean sublime. Ruskin presents them, moreover, as alternative responses to sublime situations. In point of view or mode of comprehension and composition, they are closer to an ordinary way of seeing, the excursive and not the sublime. But in feeling and imagination, they lay claim to the power, and hence presumably the satisfaction, associated with extraordinary, sublime vision. Both responses are carefully distinguished from the full imaginative grasp of the artist or poet. We might call these categories of aesthetic response a spectator's ,01 reader's sublime. The significance of the two Ruskinian categories may be clearer if we look again at the usual meaning of the sublime for the traveler. [111/112] Sublimity may have been increasingly associated with poetic vision, but this did not mean that it was inaccessible to the ordinary viewer. Quite the opposite, as writers from Gilpin through Wordsworth agree. Sublimity was a challenge, requiring a sudden, difficult, but rewarding shift in the mode of perception. The example of the poet's response was a model for imitation by less privileged spectators. The results might sometimes be more ridiculous than sublime, but the challenge of a poetic way of seeing, to feel an immediate impression of sublimity before the Alps or St. Peter's, was widely felt by the most ordinary of picturesque travelers. Ruskin too defines a sublime mode of seeing that poets and artists exemplify. But that mode of seeing, the inventive or imaginative, is, he insists, not imitable by every spectator. Poetry and art command awe but not imitation. The artist's sublime grasp of total form and meaning cannot be a model for the spectator's experience. Ruskin's grotesque and noble picturesque can best be taken as different responses to the challenge—or burden—of sublimity, to what Byron in Childe Harold's Pilgrimage earlier called "All that expands the spirit, yet appals" (III. 62.). They describe other ways of attaining comprehension, based on the spectator's own habits of perception and not on an assumed identification with the artist's privileged way of seeing. In this respect the Ruskinian sublime is a major departure from the romantic sublime and its imperatives. Although Ruskin may well have found suggestions for his antipoetic approach to sublimity among the romantics themselves, particularly the later Wordsworth and Byron , and Turner, his rejection of the poetic sublime as a model for spectators is both more explicit and more sweeping. The spectator's leisurely way of seeing and partial, fragmented views become in Ruskin's criticism a representative human experience, as the sublime grasp of the artist, though it does and should continue to command awe, is not. In a significant alteration of romantic priorities, Ruskin puts the beholder before the artist as his model for the reform of perception that he saw as essential for the nineteenth century. The beholder's share and, particularly, the beholder's sublime are at once a description of and a prescription for a new way of seeing. Mosr romantic examples of sublime experience provide a sense of exaltation derived from the confrontation with greatness. We [112/113] might distinguish two kinds of sublimity in romantic landscape experience, a positive and a negative, according to the absence or presence of terror and difficulty in the confrontation with awesome natural power.2 To each kind of sublime experience there are several possible resolutions. When the confrontation with greatness is not very terrifying or difficult, the experience may conclude either with an unselfconscious participation in that greatness or with a self-conscious identification of the admired greatness as (or as like) our own. The passage from Book IV of The Excursion discussed in the last chapter is an example of unselfconscious participation concluding a positive experience of sublimity. This seems also to have been Ruskin's characteristic response to mountain sublimity in his youth, as we shall see later. Wordsworth's ascent of Snowden (in The Prelude) is an example of the second resolution to positive sublimity. The poet discovers in the natural landscape an image of the power of his own imagination. In the negative or terrible sublime, we may move from fear to exaltation by several routes. We may successfully resist the felt threat of an external power. Resistance brings a sense of our own mental and emotional strength. Or we may do no more than recognize the feared power. The recognition, especially when it involves naming or articulating that power, is also a form of mental mastery. The Burkean sublime is a negative sublime: terror and fear are indispensable parts of the experience. The notion of resistance is also implied in the connection Burke draws between sublime response and the instinct of self-preservation. Wordsworth's passage through Gondo Gorge is another example of the negative sublime. Wordsworth, however, gives two resolutions to this experience: that of simple recognition or naming (the fearful shapes and sounds as types and symbols of apocalypse) and a second, in the preceding apostrophe to his imagination, in which successful resistance is implied and the types and symbols very nearly appropriated as an image of imaginative power. To the extent that we believe the appropriation, the experience seems positive—though terfor remains in other aspects of the account.3 Despite Wordsworth's efforts to transform this particular experience of the negative sublime, however, the difficult or terrible sublime is probably the most common form of romantic sublimity. My simplified account is partly designed to bring out one common assumption, shared even by recent writers on the subject: the only alternative [113/114] to a successful attempt to comprehend greatness at the moment of confrontation is failure. When we cannot identify with natural power, or fail to subdue or comprehend it through resistance or recognition, we must give up the challenge. We return to an ordinary mode of perception and feeling without the sense of exaltation that comes from the successful attempt at comprehension. The sublime experience has not occurred. Actually, neither Wordsworth nor Byron nor Turner accepted this restricting view of sublime experience. Turner provides access to his sublime landscapes through figures of ordinary beholders with limited or partial comprehension. In The Prelude Wordsworth portrays fearful confrontations as sublime even when comprehension is delayed. Imagination works in and through memory to master natural power. More important for Ruskin, however, is the apparent lesson of The Excursion. Terrible or negative sublimity is not an issue for the wandering spectators in that poem. Positive sublimity, resolved by unselfconscious participation, remains a possible experience, but it is far less important than the reformed picturesque or scientific sight of Books I and IV. Wordsworth seems to offer these modes of experience as alternatives to the emotional satisfactions of sublimity, replacing the more difficult achievements of the negative sublime. Byron does not give up the attempt to comprehend a difficult greatness, as Wordsworth may seem to do in The Excursion. He substitutes for immediate mastery a "gradual grasp" or piecemeal approach, applied even to traditional sublime subjects. His preference for the piecemeal approach is reflected in the open-ended, digressive structures of both Childe Harold and Don Juan. In the earlier poem, this approach develops directly out of the needs and habits of the traveler. St. Peter's is a "fountain of sublimity" which can draw the mind of man toward greatness (stanza 159), but only when it is experienced excursively, by a spectator who takes it in gradually as he explores it physically. To stand in front of it expecting to be overwhelmed and then exalted is to doom oneself to failure. The great dome cannot in fact be seen from this position. More important, the spectator has imaginative as well as physical limitations which can be overcome only by replacing confrontation with progressive exploration.4 For Byron this is not giving up the challenge of the sublime, but meeting it in another way. Ruskin, of course, knew the Byron passage as well as he knew The Excursion. His diary for 1840 and 1841 records his own repeated and unsuccessful attempts to see the Renaissance grandeur of St. Peter's as sublime in the conventional manner: to find some point of view from which to be overcome by the massive whole.5 We cannot know that Ruskin had Byron's and Wordsworth's recommendations to the traveling spectator specifically in mind when he began to formulate his own notions of a beholder's sublime, eight years after his failure to respond to St. Peter's. Yet like the two poets, Ruskin responds to the burden of negative sublimity for the traveler neither by urging imitation of more gifted observers nor by giving up the challenge, but by proposing alternative routes to comprehension and emotional satisfaction. [115/116] His grotesque substitutes a reduced but single image for the grandeur of sublime vision. His noble picturesque, like Byron's gradual grasp or Wordsworth's excursive power, substitutes progressive for immediate response— and lays claim to a different kind of emotional power located in conventionally picturesque as well as in sublime scenes. Like Byron's traveler, Ruskin was initially reluctant to take up the challenge of the romantic sublime. When he wrote Modern Painters I he wished both to exalt Turner's art as awesome and unapproachable and to insist that readers could understand Turner's greatness if they would only try. The former attitude would ordinarily have meant presenting Turner's art as sublime; the latter, approaching it as one approached landscape encountered on one's travels: analyzing, comparing, tracing out details, and even drawing them. Ruskin did both—but when it came to explaining the aesthetic theory behind his praise of Turner, he avoided using either of the conventional terms "sublime" or "picturesque." Sublimity, he explained, was not a separate aesthetic category: "the sublime is not distinct from what is beautiful, nor from other sources of pleasure in art, but is only a particular mode and manifestation of them" (3.130). He does not even discuss the possibility of a special picturesque source of pleasure. As Landow has demonstrated, Ruskin excludes these categories, particularly the sublime, because he wants an objective definition of aesthetic value, predicating a single human aesthetic response. The sublime and picturesque have been since Burke described more often in terms of contrasting psychological responses than of the objective qualities of external objects (Landow, 183-87). Another way of stating Ruskin's procedure in Modern Painters I (and for the most part, Modern Painters II) would be to say that he suppressed those aesthetic terms associated with a specific point of view or special conditions of seeing. "Beauty"—the only term of the conventional triad he retains—implied no such limitations. Where the sublime was understood as a single impression of unity, without conscious recognition of parts, and the picturesque as a progressive perception of parts, without an immediate comprehension of unity, the beautiful was frequently described as the conscious perception of both the whole and its parts, of unity in multiplicity.7 The beautiful, in these terms, seems to imply a neutral perceptual norm, subject to none of the special conditions demanded by the sublime or the picturesque. All aesthetic experience, Ruskin maintains, can be described as the experience of beauty; variations in point of view produce no significant alteration of what is essentially a single aesthetic response. [116/117] By 1853 Ruskin had quietly changed his earlier position. Modern Painters II already contained references to sublimity as a different kind of aesthetic experience—primarily as the experience of awe. The drafts for Modern Painters II contain notes for a separate section on the sublime in which Ruskin recognizes it as a distinct aesthetic category. There is no formal discussion of the sublime in the published volume, but Ruskin included chapters on sublime style and on the picturesque in The Seven Lamps of Architecture (1849). In 1853, for The Stones of Venice III, he briefly described a different kind of sublimity, the sublimity of terror. Throughout the l850s Ruskin apparently continued to plan a full, formal discussion of the sublime for a later volume of Modern Painters, but though notes survive, no chapter was included in the published volumes. Ruskin's planned discussion of the sublime is replaced, in the last volumes of Modern Painters, by renewed discussions of the grotesque and noble picturesque, and of the artist's power of invention. These alternatives to the romantic sublime address problems of contemporary perception Ruskin had not recognized in 1843. For the beholding imagination, differences in physical and psychological perspective were critical, as Ruskin gradually realized. His personal encounters with the sublime contributed to his change of mind. Accounts from 1842 and 1853 suggest that he found sublimity newly terrifying by the early l850s. The grotesque and the noble picturesque resolve difficulties for the doubting romantic spectator that Ruskin himself experienced. It was as if the sun had been taken away from the world, and the life of the earth were ebbing away, groan by groan. Ruskin' paragraph goes on to drive home the essential fact about his own response to the dramatic revelation of fiery peaks through dark clouds: his complete loss of self-consciousness, which led to exaltation. With all that I had ever seen before—there had come mingled the associations of humanity—the exertion of human power—the action of human mind. The image of self had not been effaced in that of God. It was then only beneath those glorious hills that I learned how thought itself may become ignoble and energy itself become base—when compared with the absorption of soul and spirit—the prostration of all power—and the cessation of all will—before, and in the Presence of, the manifested Deity. It was then only that I understood that to become nothing might be to become more than Man;—how without desire—without memory—without sense even of existence—the very sense of its own lost in the perception of a mightier—the immortal soul might be held for ever—impotent as a leaf—yet greater than tongue can tell—wrapt in the one contemplation of the Infinite God. It was then that I understood that all which is the type of God's attributes—which in any way or in any degree—can turn the human soul from gazing upon itself— [118/119]. . . this and this only is in the pure and right sense of the word BEAUTIFUL. Like Wordsworth at Gondo Gorge, Ruskin experiences a shift in modes of perception. Wordsworth's publication of "The Simplon Pass" as a separate fragment implied the isolation of the sublime moment. In The Prelude, interruption in the traveler's account is reinforced by an intervening apostrophe to Imagination. Ruskin's passage begins with a long description of the valley and fountain; he has already stopped traveling, but lying by the fountain he remains a minute observer of visual and aural detail, until the crash of thunder makes him look up and begin to see differently. The shift in modes of vision is much less marked. There is a transitional phase of stationary observation, but no disruption of sequence. Once Ruskin has begun to see differently, however, he, like Wordsworth, goes on to convert an intense visual impression of natural power into a religious language of divine types. For Ruskin, this language is not his own: recognizing it, he recognizes a mental power not his own. Natural power and divine mental power are the same. The experience is wholly positive. Ruskin attributes his pleasure to his complete self-effacement, and, as Landow points out, it is much more complete than in Wordsworth (112). But of course there is an eventual return of self-consciousness in Ruskin, too. His account of his exaltation locates it in the perception of the temporary annihilation of self, a perception that requires self-consciousness: I learned, I understood. "To become nothing" is followed by "to become more than Man." This is a sublime of participation in which there is an eventual recognition of self that comes through an initial complete self-absorption in external power. The scene presents no difficulties. Ruskin is able to shift to an exceptional way of seeing and successfully grasp the scene imaginatively. He feels no resistance or tear when he then sees the forms of natural power as visible characters in a divine language. The Wordsworth passage is much less clear on both these points. Not only is the shift first felt as an unwanted interruption, but Wordsworth's attitude toward those types and symbols is not unambiguously presented. The description itself makes a simple comparison: [119/120] natural sounds and forms were all the workings of one mind, types and symbols of Eternity. There is no direct expression of exaltation through participation here. In fact, without the lines to imagination, the whole experience is introduced as one of dejection: "a deep and genuine sadness"; the sleep of the immediately following night was melancholy, the lodging dreary. 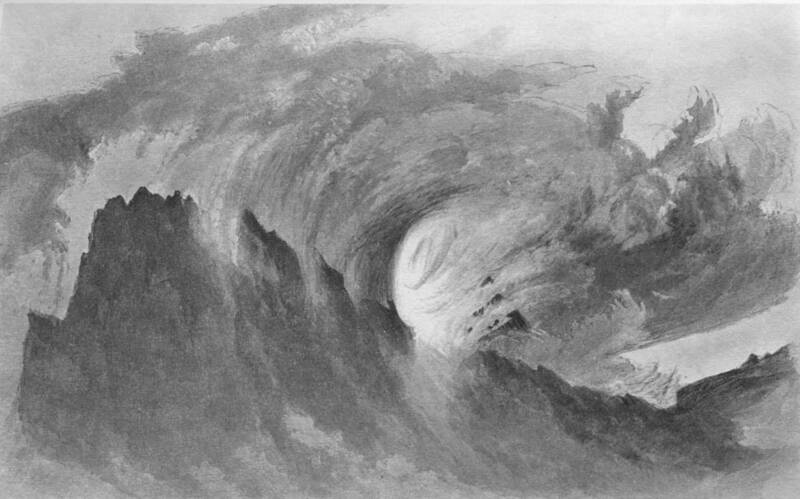 There are some grounds, then, for Weiskel's reading of the passage as an example of the negative sublime: a submerged record of difficulty in confronting the sublime or making the shift to another way of seeing, and fear or resistance at identifying with the divine mental power, the symbolic language of natural forms (Weiskel, 201). The positive version of this experience, according to the text itself, came later and involved a reinterpretation in which the exaltation did not come from participation in natural-divine power, but from the recognition of the imaginative power of the poet's own mind. The types and symbols have been appropriated as Wordsworth's own linguistic signs, the mnemonic signs that inform the imagination, and allow it to inform the world, of the presence of Wordsworth's shaping genius at that place. In the finished poem the negative and positive versions of the experience are juxtaposed but not reconciled (Weiskel, 204). The emotional tone of the Simplon Pass can be variously interpreted according to whether one takes as context the lines on imagination or the description of the preceding and following parts of the experience. The tone of Ruskin's passage, however, like that of the passage quoted earlier from Book IV of The Excursion, is clearly positive. In this respect Ruskin's experience is quite consistent with the kind of sublimity he had renamed the beautiful in Modern Painters I: a sublimity limited to the apprehension of greatness without fear. "There is no sublimity in the agony of terror," he wrote, in flat contradiction to Burke and to the testimony of Wordsworth's poem (3.129). This is the same explanation of sublimity that Ruskin offered for the positive experience at Chamounix. Self-effacement there was pleasurable because it revealed the "peace of God"; self-effacement before destructive natural forces in 1853 is pleasurable (though terrifying) because it reveals the might of a potentially wrathful God, the awfulness of sin and death. One can, then, read Ruskin's recognition of a terrible sublime as an indication of his own increasing difficulty with comprehending sublime scenery in the theological terms by which he had understood it at Chamounix. The difficulty of the sublime way of seeing is not, in this case, visual or imaginative. The explanation of terrible sublimity as the divine language of apocalypse offered in The Stones of Venice is the assertion of the will to maintain belief. The stress on terror points to a new sense of diffculty encountered and overcome. e have been looking at Ruskin's example of the terrible sublime--nature read as the language of fearsome apocalypse—as if it were an independent exposition of sublimity. It is time to return that passage to its context. Ruskin describes the terror of natural imagery of sin and death in order to distinguish from it what he treats as a far more common and important response to awesome or fearful subjects, the state of mind that produces the grotesque. Here we find an alternative, effective resolution of the terrible sublime. The grotesque is an elastic category that seems, in the course of Ruskin's discussion, to be [123/124] continually expanding until in retrospect it may even include his own illustration of the terrible sublime. The true sublime, by contrast, shrinks to a hypothetical point, a limiting term for the expanding category of the grotesque. Thus, although Ruskin begins by defining the grotesque as inferior to sublime perception, he ends by exalting it until it becomes the highest humanly possible response to sublimity. "And thus in all ages and among all nations, grotesque idealism has been the element through which the most appalling and eventful truth has been wisely conveyed . . . No element of imagination has a wider range, a more magnificent use, or so colossal a grasp of sacred truth" (5.134). If we look closely at the terms by which Ruskin distinguishes between the grotesque and the sublime, and at those he describes as the perceivers in each category, we can connect Ruskin's personal reaction to sublimity to his attempt to reform nineteenth-century habits of viewing art and landscape. Ruskin defines grotesque art in terms of the state or condition of mind that produces it: he recognizes what he had denied in Modern Painters I, the importance of point of view. The opposed states of mind that produce grotesque or sublime art are described in phrases remarkably similar to those used to make the contrasts between excursive and sublime modes of seeing, or between the beholder's and artist's approaches to art. Ruskin attributes to the grotesque state of mind such positive qualities as curiosity, capability of surprise, delight in variety, and a certain waywardness (11.154,157). Minds in such a state "gather, as best they may . . . various nourishment." They exhibit partial attention, making a "playful and recreative" application of fancy and imagination to serious subjects. Leisurely recreation, curiosity, expectation of surprise, pleasure in variety, gathering or collecting with no fixed plan or design—in all of these characteristics of the grotesque we can recognize the traveling spectator's pleasures as described in landscape literature. The connection becomes at one point explicit: Ruskin names this playful grotesque "the art which we may call generally art of the wayside, as opposed to that which is the business of men's lives." Such art is a "stretching of the mental limbs," a "leaping and dancing of the heart and intellect, when they are restored to the fresh air of heaven" from the imprisonment of work. The common identification between leisure and travel persists in Ruskin's metaphors. The grotesque, then, is produced by a condition of mind closer to [124/125] that of the ordinary contemporary viewer than to that of the imaginative artist. The negative aspects of this state of mind, brought out through comparison with the mind that produces a really sublime art, make clearer the presence of a familiar distinction. The sublime state of mind is notable for "the scope of its glance," the breadth or depth of its grasp, its apprehension of highest truths, its compass of human sorrow, its power of contemplating things in their true light, as if reflected in a mirror; such a mind is raised above the playful distraction of the grotesque mind. It presents truths seen in wholeness (11.152,156, 178-81). The grotesque mind by comparison exhibits a narrowed vision, some shortening of the power of contemplation, a failure to grasp the highest truths; it does not "enter into the depth of things"; it is "imperfect, childish, fatigable" (like the "eminently weariable" imagination of the spectator). Its imagery is like that seen through a broken, distorted, and dim mirror—which seems partial, fragmented, with parts separated and out of proportion, apparently the product of no overall imaginative design (11.178-181). Thus the state of mind that produces the grotesque is not only connected with that of the picturesque traveler; it is also specifically described as inferior to another state of mind: the raised and fixed perception of contemplation, where large design or meaning is grasped or comprehended by the imagination. When the beholding imagination pauses and "dwells upon certain conditions of terribleness," it produces grotesque perceptions. The complete depth of the terrible greatness it confronts may be drawn out of the partial image at some later time. Ruskin extends the meaning of grotesque along lines already laid down by romantic writers, but his grotesque has finally a very different relation to sublimity. Burke paired the sublime and the grotesque for purposes of contrast: the serious with the trivial (Enquiry, p. 64). The same pairing was also used in the mid-eighteenth century to contrast the serious with the comic. Hogarth begins the growing tendency to take the grotesque more seriously. For him, caricature, a bridge between the grotesque and the sublime, was a serious comic art.15 German romantic writers like Friedrich Schlegel and Jean Paul Richter stressed the common ground between the grotesque and the sublime while maintaining their opposition.16 The distorted and hieroglyphic imagery of the grotesque possessed both the terrifying power and the obscure significance of the sublime, but the grotesque alone was diabolic. Some continental romantics discovered a connection between the somber, comic-tragic deformities or limitations of the grotesque and a general modern or human condition. Victor Hugo, for example, paired the grotesque with the sublime as the two great poles of human experience: the grotesque, bestial, infernal, and inhuman at one end, the spiritual or sublime at the other.17 But Walter Scott, reviewing E.T.A. Hoffmann's stories, objected to the link between the grotesque and the diabolic. Hoffman's grotesque tales, he complained, were too horribly fantastic, the wild imaginings of an uncontrolled or [126/127] diseased imagination, without moral point.18 Ruskin's grotesque preserves the association with the sublime and exhibits all of the romantic tendency to take the grotesque seriously, especially to take the grotesque as representative of human limitations. But his discussion of the grotesque might be read as a response to Scott's objections, for Ruskin deliberately strips the "true" grotesque of its connection with the bestial, the satanic, the inhuman, and the immoral. His grotesque is the attempt of the limited imagination to come to grips with sin and death, but if it is true grotesque it reveals not moral corruption but moral aspiration in the perceiver. In this sense too Ruskin's grotesque is a version of the sublime. Ruskin's elevation of the romantic grotesque toward the sublime should remind us that the relation he posits between beholder and artist is not a simple opposition either. The grotesque is not a category of aesthetic consumption. It embraces a range of productive activity, from the rough humor of the working man at play, through the witty, ornamental, and often amateur art of a more educated and leisured class, to the fantasies of Shakespeare; or from the dreams of ordinary people to the symbolical imagery of Dante and the apocalyptic visions of the biblical prophets. The true sublime, by contrast, is a class that may have no members at all. Ruskin gives no examples. It is, at any rate, a very rare state of mind, the condition of completely clear and comprehensive vision, of absolutely governed imagination, of an obviously godlike grasp of visual design and metaphysical order. What is important, though, is not so much the shrinking sublime as the expanding grotesque. Ruskin's intent here seems to be to establish a continuity between crude humor and visionary art—and to place the amateur art of the middle-class excursive spectator within that spectrum of active imaginative response. In this effort Ruskin sets himself against the tendency to regard art and aesthetics as exclusively constituted by two sharply divided groups: imaginative artists and middle-class consumers, those who can create and those who can "taste." I do not mean to suggest that Ruskin is advocating a democratic art. He continues to be concerned principally with middle-class spectators and with artists, and to insist on maintaining some absolute distinctions between them. He describes the activity that produces the grotesque, as we have seen, quite traditionally in terms of the leisure activities of a middle class: travel. The [127/128] comprehensive grasp associated with the true subject in this chapter is identified as the exclusively artistic power of invention in the later volumes of Modern Painters. The unlettered worker is represented only by a figure from the past, the medieval stone carver (though that, Ruskm argues, indicates a larger problem in contemporary art). Ruskin's emphasis on the grotesque does not indicate any desire to abolish a hierarchy of vision based both on imaginative ability and on social class. It does, however, put a new stress on the active, imaginative nature of the response possible from, and indeed required of, the spectator. Taste, acquired passively through traveling and reading, is not enough. Ruskm is interested in a response to landscape and art somewhere between picturesque taste and sublime comprehension or poetic invention. Failure to rise immediately to the challenge of the sublime in art or nature need not mean spectators must give up—or reduce what they see to a superficial collection of interesting textures and shapes. Artists and poets and those of no taste as well as ordinary educated spectator-amateurs employ an alternative mode of seeing. This mode is not a function of social class and imaginative ability, although Ruskin is primarily concerned that it be adopted by his middle-class readers. Dreams, visions, fantasy, wit, humor, satire, Gothic grotesques—all are examples of this alternative way of seeing, given concrete expression as a form of art.19 The picturesque landscape sketching of amateurs, one might argue, could be another—if, as in some of Ruskin's own later drawings, it suggests the visual exploration, by a narrowed and broken vision, of what is sensed but not fully seen as vast, significant, and complexly ordered. It is tempting to see Ruskin's own criticism as a form of grotesque art: the concrete expression of an active and imaginative mind approaching the difficulties of landscape or great art by suggesting, and then expanding, partial images. Ruskin's 1853 description of the terror of thunderstorms is not an impressive example of his prose. The terror is there, but the comprehension, through a consistent apocalyptic imagery, is too easily and quickly attained—much more easily and quickly than in Wordsworth's Simplon Pass description. I would like to repair the injustice of my first choice by offering here two much finer examples of what could be called Ruskin's grotesque art. The first is a drawing, Venga Medusa, which condenses the tenor of the thunderstorm into a single fragmentary but emblematically titled image. The second [128/129] is a passage from Ruskin's manuscript chapter on the terrible sublime, probably written between 1856 and 1860, when its closing sentence was incorporated into a different passage in the published version of Modern Painters V. The manuscript version is appropriate here because it introduces the impressive imagery of the last sentence at the end of a paragraph confessing an inability to see and understand. Terrifying description is offered not as imaginative grasp but as an expression of a partial and distorted vision, as terrible facts described but not mastered. Such vision, though not ordinary, is not privileged either. It is a mode of seeing in which the ordinary spectator can and should sometimes share, an alternative to the comprehensive grasp of a hypothetical true sublime. There is no rationalization of the bitterness or terror, and no balanced composition. Ruskin suggests a single image for the world's evil, the pallid charnel house, initially reducing the awful globe to a grotesque. In Ruskin's grotesque prose, however, the single image is not the end. The rest of his sentence step by step expands that image until it regains, finally, the grandeur he could at first only urge us to imagine ("Try at least to see it"). Pallor grows bright, then glaring, then blinding white. The house becomes a ball that is put in majestic motion and set in the vastness of space beneath the sun. The limited death of the charnel house breaks out into those human ashes strewn over [129/130] the ball, which finally engulf the earth "with death from pole to pole." The confessions of difficulty and limited imagination that form the first part of the paragraph are the prelude to this alternative response to the challenge of sublimity: the grotesque image progressively expanded until it approaches the terrible sublime. Ruskin's terrible grotesque assigns to the spectator the role of a lesser artist—the amateur, the workman, the critic. But Ruskin also approaches the problem of sublimity from another direction. There is, he suggests, a way to achieve the emotional exaltation of sublime experience without interrupting excursive progress and producing grotesque images. His noble picturesque is explicitly introduced, in The Seven Lamps of Architecture, as another version of sublimity—a "parasitical sublime" (8.236-237). In fact it invades unannounced even Ruskin's discussions of the true sublime in Seven Lamps, as it does again in the manuscript chapter on terrible sublimity written between 1856 and 1860. "The Lamp of Power" (text) is a discussion of sublime style in architecture. The notion of sublimity at work is not the terrible or difficult but the awesome: "a severe, and, in many cases, mysterious, majesty, which we remember with an undiminished awe, like that felt at the presence and operation of some great Spiritual Power" (8.100). When Ruskin says that sublime buildings depend on a sense of magnitude proportionate to their surroundings and to the human figure; or that they "have one visible bounding line from top to bottom, and from end to end" (8.106); or that they often rely on breadth of plain wall surface to achieve an effect of weight and massiveness; or that "after size and weight, the Power of architecture may be said to depend on the quantity . . . of its shadow" (8.116)—he is in every instance judging the effect upon a spectator presumed to be standing in one place receiving an impression of the whole. But partway through the chapter there is a change. When Ruskin takes up the importance of shadow, he explains it not as conveying the awe felt before a supernatural power, but as expressing "a kind of human sympathy, by a measure of darkness as great as there is in human life . . . the truth of this wild world of ours . . . the trouble and wrath of life ... its sorrow and its mystery . . ." (8.116-117). The identification is not with power but with human powerlessness; the emotion is not exaltation but sorrow [130/131] and sympathy. Similarly, the discussion of shadow that takes up the major part of the chapter pays constant attention to the mass and breadth of the whole, but as he explains how that effect is achieved, Ruskin moves into closer focus, illustrating by details. "A noble design may always be told by the back of a single leaf" (8.124). The drawings with which he illustrates his text are all of details, parts of a facade drawn from close up, from a point of view quite different from that assumed by the spectator trying to take in the whole at one glance. There is an unannounced change in both emotional and physical perspective within this chapter on the sublime. Comprehension of the visual whole or of the power it expresses is being achieved by an examination of parts, by a sympathetic understanding of how power or overall design is expressed in details. This focus on expressive details is properly that of the chapter on "The Lamp of Memory" (text). Picturesqueness or parasitical sublimity is there defined as "characters of line or shade or expression" productive of sublimity but "found in the accidental or external qualities" of an object (8.237). Picturesqueness is expressed in independent details; true sublimity in the design or power of the wliole, to which the parts of course contribute. Picturesqueness and sublimity are then versions of each other, as Ruskin's alternative term suggests. The difference between them implies a different visual perspective or focus: "the picturesque direction of their thoughts is always distinctly recognizable, as clinging to the surface, to the less essential character" (8.240). As Ruskin writes elsewhere, the picturesque way of seeing involves not so much composition—the artist's power to immediately imagine a whole—as decomposition, breaking a whole into unrelated parts (1.2.313). Though the parts may be gathered together, they are not reintegrated into the kind of wholeness that the sublime spectator looks for. The concentration on accidental surface detail also is a mental characteristic of picturesque spectators. They do not concentrate on the "centre of thought" (8.236) of the objects they regard. To become a picturesque spectator is, in one sense, to give up the challenge of the sublime. This passage is a remarkable illustration of a transformation of emotional response linked to a change in visual focus. At the beginning of the passage the building is a single personified presence that bears "witness against, men." It seems a stern and judgmental power in which the spectator hardly participates. Awe, or more likely fear, is the unexpressed emotional attitude the spectator adopts. But as the passage goes on, the building seems to be opposing not human beings but "the transitional character of all things"—a perpetual natural flux and change to which we are also subject. Viewed this way it becomes, in a fine reversal, not a witness against us but a point of identity for us. It now serves to evoke a humanistic sympathy binding us with people of "forgotten and following ages." That there has also been a change in the way the building is seen is suggested by a subtle shift in metaphor. The building that bears witness against men is immediately a living power; it is above all a voice. The building that can "half constitute the identity" of nations is a set of walls and pillars differing from "the natural objects of the world around it" only when it has acquired the visible marks of age, "that golden stain of time." When it has assumed this character it acquires language, a language written on its walls. The building is no longer a living power, impressive simply as "voicefulness" (not yet articulated [132/133] into "approval or condemnation"). It is instead a record to be read, a history of human fame and suffering. In becoming a reader, the observer must shift attention from the building's overwhelming and unified presence to the scattered individual marks of passing time on its surface, the stains and cracks and rents in aging masonry. The change of metaphor implies the shift from immediate grasp of a whole to the linear or progressive attention to details we have been discussing as characteristic of the excursive and the picturesque. In this passage as throughout the two chapters on power and memory, the alteration in emotional response seems wholly satisfying. Awe or fear of an alien unknown becomes an expanded human sympathy. The noble picturesque provides an aesthetic response that is emotionally and morally desirable—perhaps more so than that of the true sublime. Ruskin's manuscript chapter on terrible sublimity, written mostly in the late 1850s, further explains this preference. In the draft passages for this chapter published by Cook and Wedderburn, the terrible sublime is discussed as a problem, as it is not in the published volumes of Modern Painters. Ruskin starts with the difficulty hedged in The Stones of Venice and taken up again in Modern Painters III: if, as he had once asserted, the sublime is never terrible to the believer, must we understand the terrible sublime simply as a symptom of faithlessness in the perceiver? In the language of Modern Painters II, has the modern love of cloudy landscapes any positive value? Ruskin's answer in the draft passages is close to that of Modern Painters III: pleasure in terror, in any age of disbelief, is initially a sign of a valuable sensitivity to natural and supernatural power. But the continued pursuit of pleasure in terror is more suspect. The sanest people will turn away from terror as they discover beauty, except under conditions of unusual stress. When we do return to pleasure in terror, we can do so nobly or basely; the difference turns on the nature of the emotional resolution of the experience. In the base sublime, pleasure comes from active identification with the absolute strength of a terrible power and extends even to "actual enjoyment of the idea of pain"—a pleasure that Ruskin rejects completely (4.377). The perceiver in the noble sublime begins by opposing a terrible supernatural power and ends by sympathizing with the human objects threatened by that power. Sympathy "lay be turned inward: a bad conscience or physical weakness makes the observer unusually attracted to manifestations of destructive [133/134] powers, in order to resist them. The pleasure of terror comes in the affirmation of the human against a sweeping but fearsome power. The affirmation is, however, purely personal. But the movement of sympathy may also be outward. Then it is compassion for a collective humanity, the most valuable version of the dubious pleasure of the terrible sublime: "a noble, but doubtful and faithless compassion for the agony of the world" (4.380). In Ruskin's discussion of the emotional responses to terrible sublimity, point of view is, in a purely metaphorical sense, the crucial issue. He insists on a rejection of the comprehensive divine perspective on moral and humanistic grounds: to identify with a terrifying destructive power is to take pleasure in causing pain. But he warns of the dangers of substituting for this supernatural perspective the single, limited view of the isolated spectator. To merely rejoice that one can resist the power that attracts and threatens is selfish. His solution, offered as the best alternative in a world where the divine point of view is terrifying, is a multiplication of limited perspectives, an expansion, through compassion, of a deliberately partial but stubbornly human point of view. Ruskin's grotesque and noble picturesque present what had been simply a spectator's way of looking at pictures or landscapes as a mode of perception equal in epistemological importance, and in emotional and imaginative satisfaction, to the privileged category of the sublime. These altered versions of excursive seeing are alternatives to a conventional sublime which tend actually to replace it. His grotesque and noble picturesque are in part a solution to a personal difficulty. But Ruskin has identified the difficulty as a general cultural one as well—a new terror and fascination at the appearance of destructive natural power, which cannot be enjoyed as the manifestation of a benevolent natural or divine order. In Modern Painters II and IV the general cultural difficulty with the sublime affects the artist, too. First grotesque and then picturesque art become a cooperative effort between artist and spectator to comprehend greatness and enlarge sympathies. The grotesque is examined in Modern Painters II not primarily as the rough humor of ordinary people, but as the symbolical or allegorical vision of the artist or poet. In this form it is capable of "giving the highest sublimity even to the most trivial object . . . No element of imagination has a wider range, a more magnificent use, or so colossal a [134/135] grasp of sacred truth" (5.133-134). The sublimity, the grasp of sacred truth, is nonetheless achieved through a grotesque way of seeing by the artist, and it generates as well a somewhat different kind of grotesque perception in the spectator. Grotesque vision is the most colossal grasp of sacred truth because it is the only way in which such truth can be comprehended—with the distortions and fragmentations resulting from a limited point of view. The artist's vision, faced with the challenge of a particular kind of knowledge, is as piecemeal as the spectator's. His grotesques, though capable of giving sublimity, need to be expanded or interpreted like the spectator's. Much of Ruskin's chapter on the grotesque ideal in Modern Painters III is devoted to examples of the interpretive process, the reader's and beholder's roles in multiplying the limited perspective of the artist by gathering together connected examples of allegorical imagery from the artist's and from other texts in order to arrive at sublime comprehension. This process is, in art or literature, what Ruskin calls "reading." It is the ordinary person's way of using linear to arrive at comprehensive perception, a reader's sublime—an extension of excursive seeing. The sublimity constructed by the reading process is never more than potentially present in the artist's vision. In this last description of the grotesque or symbolical sublime, reader and artist together use the partial or excursive way of seeing to arrive at an otherwise unattainable knowledge. In Ruskin's chapter on the noble or Turnerian picturesque in Modern Painters IV there is a similar sense of cooperation between artist and spectator. Here, however, the emphasis is less on necessary limitations to sublime vision in the artist than on the artist's responsibility to make the aesthetic and human values of picturesque vision available to the spectator. Ruskin focuses not on the accidental marks of age in buildings, but on the intentional and sympathetic portrayal of incidental detail in painting. He had, of course, always delighted in an intricate variety that invited leisurely progress and changing perspectives for an excursive eye. In Modern Painters I he praised the purely visual pleasures of an excursive way of seeing and, by implication, placed the responsibility for beating pictures to be seen this way on the artist. The artist in this passage is not necessarily one who sees excursively or picturesquely, but one who creates landscapes that allow a picturesque or excursive way of seeing in the beholder. Pictures possess unity, but the unity is not single. There are as many different systems or wholes as there are possible points of view. The spectator is enabled and encouraged by the strength of the connections between the parts to discover the multiple truths "totally different in aspect according to the direction" from which the parts are approached in an excursion through the picture space. Ruskin's praise of Turner in the Modern Painters IV chapter on the noble picturesque is similar. There the way of seeing is explicitly identified as picturesque, and Ruskin emphasizes the accompanying emotional movement of sympathy as much as purely visual movement. But the artist's role is the same: to enable the beholder to discover new sympathies as well as new sights while the beholder moves from point to point. The beholder learns and takes pleasure from the process of movement through the picture rather than from an immediate impression of a whole. What Ruskin praises in the Turnerian picturesque is a breadth of sympathy that is conveyed to the spectator by the artist's treatment of intricate detail. The artist is praised in this chapter not for exemplifying a different and extraordinary vision, but for encouraging the development of the spectator's way of seeing. 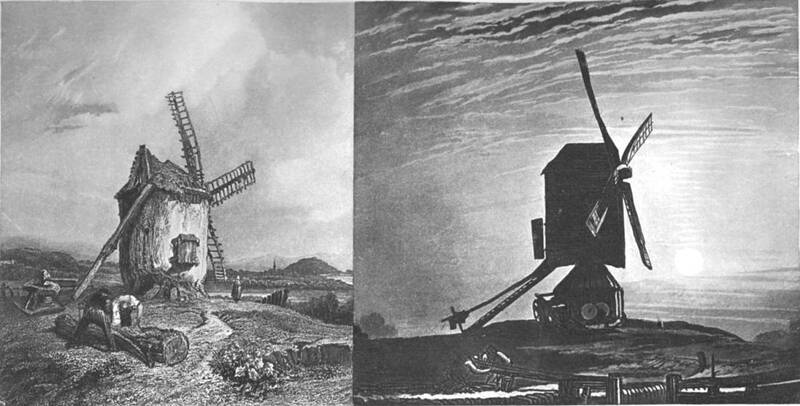 Clarkson Stanfield's ordinary or "lower picturesque" painting of a decaying windmill has an inviting variety of visual features: "its roof is nearly as interesting in its ruggedness as a piece of the stony peak of a mountain, with a chalet built on its side; and it is exquisitely varied in swell and curve . . . the clay wall of Stanfield's mill is as [136/137] beautiful as a piece of chalk cliff, all worn into furrows by the rain, coated with mosses, and rooted to the ground by a heap of crumbled stone, embroidered with grass and creeping plants" (6.16-17). Even this surface picturesque is not to be despised, but "ought to be cultivated with care, wherever it exists: not with any special view to artistic, but to merely humane, education" (6.22). But Turner's noble picturesque is still more effective in encouraging that simultaneous movement of sympathy which makes the visual explorations of the spectator so valuable as a means of humane education. Ruskin notes that Stanfield depicts a mill too fragile to function, whose decrepitude he enjoys aesthetically; he has made the mill the principal light of his picture and elaborated the textural interest of its decay. Turner's mill, though also worn, still functions; moreover lie underlines its functional purpose through the mill stones he has propped against it. Turner treats the mill as a symbol of the value and the drudgery of work. His mill is a stark, proud object on a hill, cast in shadow to express his sympathy with the continual sorrow of labor (6.16-19). The picturesque way of seeing can encourage sympathy in the spectator f even when the artist has not felt it, but the greatest paintings will be those where the artist demonstrates a power of sympathy through his treatment of picturesque visual detail. As with the symbolical grotesque, the spectator can complete the extension of the picturesque from a mode of visual to a mode of moral perception. Reading and picturesque viewing are a long way from the romantic imagination as celebrated by Wordsworth or Coleridge. Yet these apparently prosaic activities are the models for the sight whose central epistemological importance Ruskin praised in a much-quoted passage from Modern Painters III: "The greatest thing a human soul ever does in this world is to see something, and tell what it saw in a plain way . . .To see clearly is poetry, prophecy, and religion,—all in one" (5-333)' He was praising Turner and Scott as the representative modern seers: representative because of the perfect ease with which they had mastered and could teach a knowledge of the aspects of things. Ruskin's terms imply the kind of perception we have been tracing as the excursive. "Aspect" carries with it the meaning of looking from a particular direction at one side of a thing. The science of aspects is a body or facts—visual, emotional, and imaginative—consisting of more than [137/138] one aspect, facts gathered by changing one's point of view. In the last three volumes of Modern Painters Ruskin praises Turner not as the painter of nature, or of truth, or of beauty, but as the master of a new mode of perception, of the way in which nature, truth, and beauty will be approached by a modern spectator. The roots of that new mode of perception, we have seen, reach not to the sublime but to the excursive and picturesque. Readers and critics of Ruskin have not, I think, recognized Ruskin's descriptions on art and sight for what they are: a program of reform based on an insight into changes in habits of perception. Those changes he linked to a combination of mechanical inventions, new economic and social patterns, and an altered religious and philosophical outlook. His exhortations, his prophecies, his criticisms, his projects for reform assume the future importance of a new way of seeing. That new way was to be distinguished from another way, the sublime grasp he located somewhere in the distant past, or attributed to great poets and artists, or described at other times as an impossible ideal. To a remarkable extent Ruskin accepted the change in seeing he described. I say remarkable because it is equally clear that Ruskin was not happy with this change. In many ways his attitudes are parallel to those of the twentieth-century critic, Walter Benjamin. Professedly a Marxist, Benjamin described a similar alteration in the way spectators and readers experience art, pointing to technological and economic changes of the same sort that Ruskin had identified seventy-five years earlier. Yet Benjamin's work is, like Ruskin's, permeated with a profound nostalgia for a lost way of seeing—what he calls the "aura" of a work of art20 and what Ruskin called "awe." Both men accept what they see as an irreversible historical change, but the reforms they urge within this new mode of seeing are conceived in terms of a displaced romantic art. Ruskin's grotesque and picturesque are denned by the sublime; the imaginative and emotional satisfaction to be found in an expanded excursive experience must equal the promise of the privileged romantic moment. Ruskin increasingly realized that this was not going to happen. Like Benjamin, he could see that awe or aura was on its way out. But neither man ever really rejoiced in this fact. For this reason both have appealed more to readers who share their nostalgia and romantic context than to those whom they took as their subjects and sought as their audience [138/139] those ordinary modern readers and viewers who can look at art or landscape only distractedly, who feel no awe for the kind of vision they do not possess, whom sublimity leaves, as Byron put it, cold.